“We meant no harm,” Celebarad answered contritely, and their pace became a more reasonable trot as they rode down the grassy slope to the Festival Ground. What once must have been a grand pavilion in the old days of the Western Kingdoms was now the heart of the festival ground. Tents had been pitched around it, and lanterns strung between poles. Banners and bunting decorated the place in a flair of colour, and a host of smells and sounds assailed the senses. Brassica had eaten not two hours since, but her stomach grumbled as though she’d starved it all day, when the aromas of pie and roast pig and the yeasty scent of ale wafted past her nose. And there were people! Real people–by which Brassica meant hobbits, and not only big folk. They danced on the pale golden flagstones of the pavilion, or feasted around tables beneath the colourful canvas tents, or sat talking and laughing on the grassy ground. As she was noticed at the edge the grounds with Celebarad, friendly greetings and hallos were called from every corner. 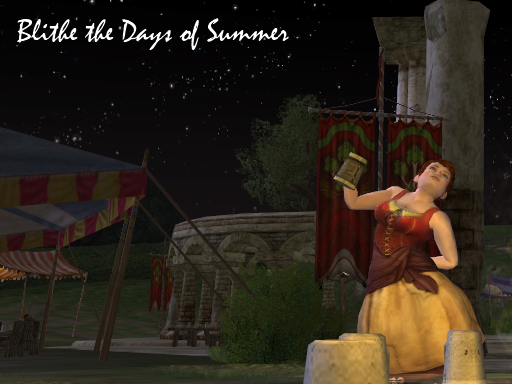 Mugs were raised and toasts were called by tipsy hobbits and townsfolk alike, and as another flight of fireworks rocketed into the air, Brassica felt a wave of dizzy, delirious happiness surge through her. Celebarad halted the sorrel again, and she pranced restlessly as her riders dismounted at the edge of the grounds. “Le hannon, muin mellon,” he murmured to the horse, and Brassica managed to grasp that it had been a simple little thank you, and thought it quite sweet. “She runs for love of freedom, and the grass and the sky and the night,” Celebarad declared, and then uttered a soft instruction in Elvish. Miriel turned and trotted up the hillside, and then a canter, and then a full gallop as she vanished over the hilltop. Where big folk tended to try and take Brassica’s introductory bombardment of questions one at a time, the gathering of five hobbits attempted to answer them all at once. Apparently Brassica hadn’t the least difficulty in processing the deluge of information, laughing and jabbering answers back at her kinfolk, and a mug of ale had made its way to her hand and an apple into her pocket, before she realized that Celebarad hadn’t joined her at the table. This was met with a chorus of “Hullos!” and “how-do’s!” and a “A great and honorable pleasure to be making your acquaintance” from Primmy. Whether it was some instinct or just his good fortune, the elf had done precisely the right thing in complimenting the hobbits, as it proved him immediately worthy of the coveted title “All Right as Big Folk Go” and had the hobbits striving to live up to the notion that they were indeed “kind folk” and in fact the kindest of folks that could possibly be found. Each of the hobbit lads hopped from his chair to offer it to the elf, in spite of two or three being free at the table already, and Primmy produced a bottle of Brandywine, pouring a generous flagon for their guest. ‘Bergine was not even remotely shy around Celebarad, and when he sat next to her, she made herself a talkative and friendly seatmate, quizzing him about words in Elvish and where he’d come from and what their travels had been like. Brassica was prodded–without much resistance–into telling the tale of their adventures, and she told them brilliantly, with a great deal of expression and occasional moments of audience participation. At one point she hopped on the table and did a stalking, ravaging impression of Percy Alroyd, which set Primmy to feeling quite off-colour, and she hastily made her excuses and retired for the evening. Everyone else thought it a splendid interpretation of a brigand villain, and imitations were performed all around the table. Brassica gleefully recounted what she had reappropriated into a great and tragic love story between Llythne and Torogethir, which set ‘Bergine clasping her hands and sighing. Then she hushed her voice down into a spooky whisper, and related their ride across the Fields of Fornost. Bungo got white as a ghost himself, and declared that he didn’t think he’d ever sleep again. As a cap to the tales she’d told, she related the finer points of her day-long rant about the Inn at Trestlebridge, and was answered with hearty agreements all around. The fireworks had ceased, but Brassica knew there were to be more, and she knew she’d be back tomorrow bright and early. So she wasn’t especially bothered, when Celebarad tugged on her sleeve and regretfully informed her that they had best head back to camp, for the next watch was his and he had promised to return. It was fortunate that he had realized this early, for there was a necessary amount of fussing around getting goodbyes said and bundling up a satchel for Brassica to carry back to camp for her other friends, which was stuffed with cold pies and tarts from an earlier feast, and flasks of cider and jars of jam and a loaf of bread. “For breakfast!” ‘Bergine declared, once this package was neatly assembled and entrusted to Celebarad. “And for you!” She presented Brassica with a yellow cotton dress, with a bright red bustier and an over-skirt of gathered burgundy linen, which she had retrieved specially for her new friend. The hobbits parted company with a great deal of hugging and cheerful farewells, and they were all much impressed by the way the elf handled the great golden mare who appeared at the edge of the festival ground. They were even more impressed when Brassica clambered up behind him, and managed not to shriek as the horse went galloping away. “Splendid,” the elf agreed, though Brassica wasn’t certain he really knew the meaning of the word, as he patted Miriel’s neck absently. “Your folk are greatly taken with talking,” he observed.